Your dog is your best friend, but as they age you may notice them slowing down and having difficulty getting around. Canine hip dysplasia is common, and you may be wondering how to help a dog with hip dysplasia. We will talk about what, exactly, hip dysplasia is, symptoms of this condition, and why it occurs. Additionally, we’ll also talk about several things you can do to make your dog more comfortable like dietary supplements, lifestyle changes, physical therapy, pain medications, and surgery. Hip dysplasia is the term that is used to describe a condition where your dog’s hip and ball joint don’t form correctly. This means your dog’s hip joint will grind together instead of smoothly gliding together. Over time, it’ll wear down your dog’s hip joint and make it difficult for your dog to walk or function properly. 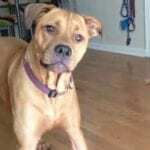 Generally, you see this condition more in large or giant dog breeds, and it is one of the most common skeletal conditions dogs suffer from. One of the best things you can do with your dog to alleviate their hip dysplasia and reduce their symptoms is several lifestyle changes. These can be small things, but they have the potential to vastly improve your dog’s condition. 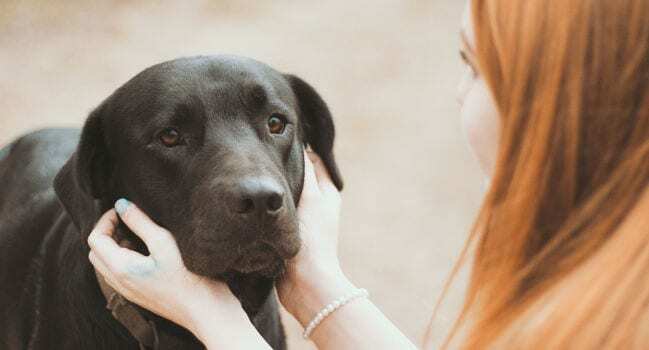 We’ll talk about four things you can do to help your best friend, and you can easily do at least one of two them no matter how busy your lifestyle is. You may see your dog standing and getting around easier with a little help. If your dog is overweight, this can increase their risk of developing hip dysplasia because there is a lot of extra stress on the hip joints. If the muscles and joints are already loose, the resulting stress could cause them to deteriorate faster. Putting your dog on a healthy diet and monitoring how many calories they consume each day is a start to getting them back to a healthy weight. Once they reach their goal weight, you can maintain it by light exercise and continue to feed them only the recommended amount of food each day. To be considered a healthy weight, your dog can fall between the healthy range for its breed. Many popular breed healthy weight ranges are listed here, or you can use this healthy weight calculator to see how much your dog needs to lose. Another key piece to help your dog’s hip dysplasia symptoms is a moderate exercise routine that is done every day. It is important to note that exercising on hard surfaces may irritate your dog’s condition, and this can result in increased pain. It is a good idea to always ask your veterinarian before you change your dog’s diet or exercise regimen, especially if they’ve been diagnosed with hip dysplasia. A good exercise routine can help to strengthen your dog’s hip muscles, and this can improve their overall quality of life. Start out slowly, and make sure your dog doesn’t overdo it. As their hind quarter muscles strengthen, they’ll work to compensate for the loose muscles that cause hip dysplasia. There are several things you can do at home to make your house more friendly for your dog to live in. These things don’t have to be large changes to make a huge difference in your dog’s quality of life. Orthopedic Dog Beds. When your dog rests, their muscles start the healing process, and this is where recovery happens. An orthopedic dog bed can give your dog the support their hip joints need, and they’re designed to help with hip dysplasia. Pet Stairs. If you have couches, beds, or other raised areas that your pet likes to get up and sleep or lay on, consider having pet stairs. These can usually be moved from furniture to furniture, and they provide support with a gentle incline which reduces the stress on your dog’s joints. Ramps. If your dog has trouble navigating stairs or they’ve never learned how to climb them, another option to try is a ramp. You can place these ramps over part of your existing stairs or up to furniture, and your dog gets the benefit of no added stress on their joints. Just like humans with arthritis can benefit from massages, so can a dog with muscle problems like hip dysplasia. A massage can benefit your dog by aiding in circulation and flushing toxins out of their system as well as reducing pain and stiffness due to their condition. Once all of the toxins are flushed out of your dog’s system, you could see an improved flexibility and range of motion. Additionally, your dog will be more relaxed, and their muscles will be less prone to locking or tensing up. You may also see any swelling go down when you get a massage routine going, as it can stimulate the healing process. Again, you should always consult with your veterinarian before you start something new with your dog to make sure you’re doing it correctly and that they recommend it. Aside from lifestyle changes, your dog could also benefit from several different supplements that support joint and muscle health. Things like bone broth, omega 3 fatty acids, and Glucosamine and Chondroitin can all be beneficial. Bone broth is also known as stock, and it is made by simmering raw bones and cartilage over an extended period of time. This allows the resulting broth to be nutrient-dense and beneficial for joint health. The bone broth can help to strengthen your dog’s bones the same way gelatin can. Bone broth acts as a natural joint supplement, and this helps to lubricate the joints for easier movement. Additionally, this can also act as a natural immune system booster because it is packed with vitamins and minerals. This is especially important in older dogs because they’re usually more prone to illness. This makes it a fantastic natural remedy for dogs with sensitivity and digestive issues, as it assists with this as well. All of these factors can contribute to making your dog healthier overall, and this is important as they age. Glucosamine is a naturally-occurring substance that is found in your dog’s body. As they age, their natural production of glucosamine goes down, and this can result in increased muscle and joint stiffness. 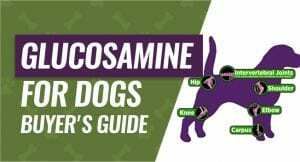 Glucosamine acts as an anti-inflammatory, and this can help to reduce your dog’s pain levels. As the inflammation is reduced, you may see your dog moving around and standing easier. Your vet may recommend you give your dog a higher dose for the first few weeks to help restore their depleted glucosamine levels; then you’ll reduce it to an average level to upkeep the healthy levels of glucosamine in your dog’s system. Another beneficial supplement to help ease your dog’s discomfort due to this condition is chondroitin. This is another naturally-occurring supplement that helps to cushion your dog’s joints as they move. The chondroitin levels begin to decrease in your dog’s system as they age, and this results in less joint flexibility. Traditionally, chondroitin isn’t taken on its own, and it is combined with glucosamine. 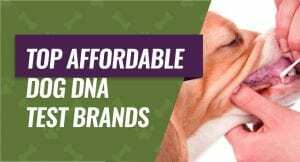 Together, these two supplements help to give your dog a sturdy base to build new cartilage on. They combine to help slow down the deterioration process the comes with hip dysplasia, and they help to reduce any inflammation that may be present. Another good supplement that will work to reduce any inflammation is omega 3 fatty acids. While your dog can produce several fatty acids, they can’t naturally produce the essential fatty acids they need. They get these essential fatty acids through their diets and various supplements. The fatty acids go to the site of the inflammation and work to reduce it by stopping additional inflammatory substances from being produced. Your dog may experience less inflammation, swelling, and pain in their joints. This will enable them to move around and stand easier. Physical therapy may also help to tone your pet’s hind quarter muscles and slow the deterioration due to hip dysplasia. This process can also help to improve your dog’s range of motion and flexibility, so they move easier throughout the day. In addition to normal physical therapy, hydrotherapy can also be very beneficial for a number of reasons. There are several ways to perform this type of physical therapy, and it is normally done in a pet therapy center or veterinarian’s office. If you want to do a low impact exercise, swim therapy is a form of hydrotherapy that may benefit your dog. Your dog will work large groups of their muscles at one time while reducing the stress on the joints because the water holds them up. If your dog likes walking, another form of hydrotherapy they may enjoy is underwater treadmill therapy. The water will support most of their weight while they build muscle strength, improve their balance, and improve their ability to bear weight on their sore joints. Hydrotherapy may also work to relax your dog while allowing them to work their muscle groups. It can increase their circulation, and this improves joint health as well as decreasing stiffness an inflammation. If your dog is overweight, hydrotherapy is an excellent way to help they lose a few pounds while reducing the stress on their joints traditional exercise may cause. The water will push against them making them work harder while it supports a portion of their body weight. If you’ve tried everything and your dog is still very uncomfortable, it may be time to talk to your vet about pain medications and anti-inflammatories. These two things are typically only used as a last resort, and you get them from your vet. The pain meds that your vet may prescribe to help control your pet’s pain are split into two groups. The more common group is called Nonsteroidal anti-inflammatory drugs (NSAIDs) and the second category is opiates. The NSAIDs help to reduce swelling, stiffness, and joint pain in humans and they can have the same effects on your dog’s symptoms. 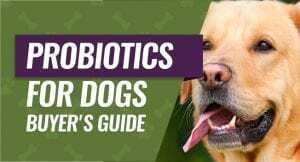 As a general rule, NSAIDs are typically safer for your dog to take and easier on their system. If you’ve done a few trials of NSAIDs and they’re not giving your dog the relief they need, talk to your veterinarian about opiate pain medications. Traditionally, vet’s usually won’t prescribe opiates for extended use, and they normally don’t prescribe steroids because of the potential side effects. Amantadine. In humans, this is used to treat Parkinson’s disease as it helps to block pain. In your dog, it can help to reduce mild discomfort related to hip dysplasia and arthritis. Gabapentin. This pain medication is traditionally used to treat nerve damaged due to various conditions. This may make your dog sleepy at first, but you should see improvement. Tramadol. This pain medication is considered to be an opiate, and it is generally used as a last resort. Veterinarians usually prescribe this if your dog is in constant pain. If nothing else is working, you could opt for a surgical procedure to help alleviate your dog’s discomfort due to their hip dysplasia. To treat canine hip dysplasia, there are four main surgical procedures you can check into for your dog. This surgical procedure is considered to be the last resort for small to medium breed dogs that are suffering from chronic hip pain that aren’t eligible for a total hip replacement. The femoral head and neck excision surgery will be performed in a veterinarian’s office, and your dog will be monitored closely after surgery. Your dog’s hip joint is made up of a ball and socket joint, and this is the part that is removed during this surgery. The veterinarian will remove the ball portion of bone, and this will prevent your dog’s bones from rubbing against one another and causing pain. After the ball or femoral head is removed, the tissue will start to form thick scar tissue in its place. This works to create a false joint to support the remaining bone, and it shifts the pressure of walking off of the leg and onto your dog’s pelvis. A downside to this surgical option is that the leg that has the femoral head removed will be shorter than your dog’s other leg. This can cause a minor limp or lameness, but there won’t be the pain that was there before the surgery. Another popular option to treat the pain that is associated with hip dysplasia is a total hip replacement. In this procedure, your dog’s ball and socket in their hip are removed and replaced by a prosthetic. Your dog’s ball and socket are replaced by a durable metal alloy and a high molecular weight plastic. Once it is put into place, your veterinarian will use a special bone cement to hold the parts in their correct places. Typically, dogs over 40 pounds will be good candidates for a total hip replacement, but your dog must be in good overall health, have a mature skeletal structure, have no medical illnesses, no nerve diseases, and have no other joint or bone problems. Additionally, your veterinarian will do a full checkup before giving the okay for your dog to have this surgical procedure. You can usually expect for your dog to spend a total of three to five days in the veterinarian’s clinic. They’ll use this time to give your dog a full checkup including x-rays, blood work, skin infection checks, and monitoring them post-surgery. Juvenile Pubic Symphysiodesis is a surgical procedure that is normally used to as a preventative measure to stop the development of hip dysplasia. It is typically done in puppies who are around sixteen weeks or four months old. Your dog will go through an initial screening that includes x-rays to assess their risk level for developing this condition. If it is found that the risk level is high, your veterinarian may recommend this surgery. Your dog will be brought in and placed under general anesthesia to begin this procedure. Once your dog is under, your veterinarian will make a small cut to expose your dog’s pubic bone. They’ll locate the growth plate and use cautery to destroy any growing cells that may be present. With this portion of your dog’s pubic bone destroyed, the other parts of bone will grow to compensate this, and this will result in tightening any loose muscles. This surgical procedure is considered to be minimally invasive, and your dog will most likely go home the same day the surgery is performed. 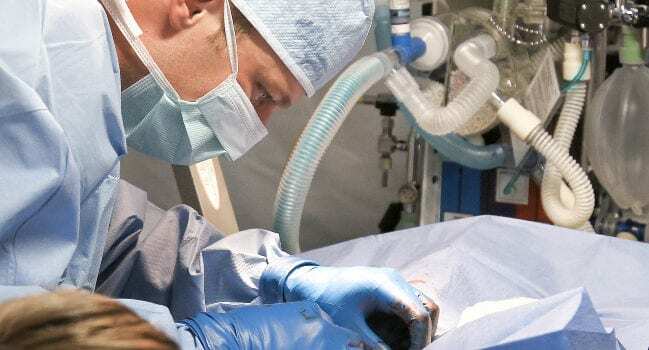 This is a surgery that you want to have performed on your dog when they are younger, and this may help reduce the chances of them developing problems later in their lives. This surgical procedure is typically performed on moderate or large breed dogs in the early stages of hip dysplasia that is usually under one year old. Your veterinarian will slowly cut small pieces of your dog’s pelvic bone away so that your dog’s hip socket can rotate over the femoral head. Once the ball and socket are in the correct positions, they are stabilized by a bone plate. The point of this surgery is to give better coverage to the femoral head portion of your dog’s joint. If your dog has evidence of developing arthritis, this surgery isn’t an option. The veterinarian will usually do one hip at a time, and space them four to six weeks apart. When the surgery is completed, your dog will typically spend at least two nights in the veterinarian’s office for observation. Your dog will be on a strict rest regimen for six to eight weeks, with x-rays at around six weeks to check the healing progress. If you’ve read this entire article, you now know how to help a dog with hip dysplasia. 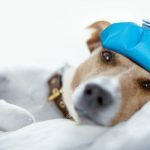 This can be invaluable information if your dog was just diagnosed with this condition and you’re not sure what to do next. You want your pet to be happy and healthy throughout their lives. By watching your dog and contacting your veterinarian if you notice any problems, you can help your dog live long, healthy lives.